Pour boiling syrup over choc. and cream, beat till melted. Found in "Bend Sinister" by Vladimir Nabokov. Published by Time-Life in 1964. 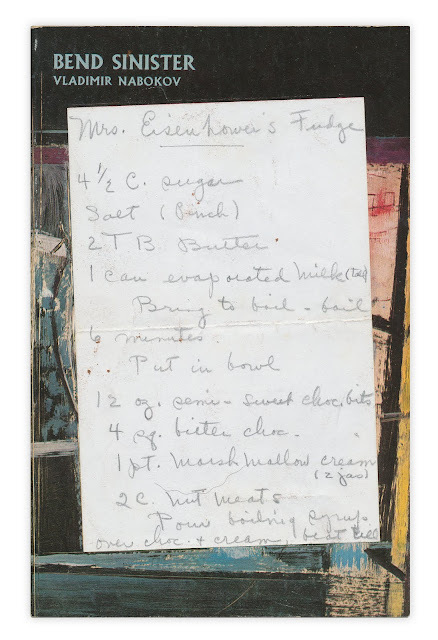 I figured that someone had just copied a recipe published by Mamie Eisenhower, so I did a little research. Sure enough, this is her "Million Dollar Fudge." Think I might have to make this! I must agree, anything with two jars of marshmallow creme is sinister indeed! nowadays you can find a recipe for microwave fudge on the back of the marshmallow creme jar... so much easier than all that boiling and stirring and cooling! Katy - I will do some investigating tomorrow when I get back the store. All I really remember is that the book (and recipe) were in a box of cookbooks and paperback fiction I got a library sale locally. Thank you! I found the recipe in both my grandma's handwriting and my mother's. This type of recipe (one that was popular across the country...) would be written over and over again and passed out to friends. Grandma called it Million Dollar Fudge on the card I have, but I always heard her also refer to it as Mrs. Eisenhower's Fudge. Interchangeable terms. On the card I have, Grandma wrote "Carnation milk" and "German's sweet chocolate," both brand names. But my grandma, after a while, would have memorized favorite recipes and if a friend asked for one, she'd jot it down without referring to her file. So she would not have written it the exact same way twice. It's the LOOK of the handwriting that is so amazingly alike!! I do not remember my grandparents having this book in their possession, but Grandma could have given the recipe to a friend who used it as a bookmark....Fun! !